So glad, finally I am writing about the way of being sick, or how you feel still O.K. even when you are sick housebound or bedbound. Since My mother has been ill for years, now at a nursing home, can’t walk, wheelchaired, with hemodialysis three times a week, hypertension, so fragile, I started thinking about the memories with her more and the feeling of being sick and weak. Should ‘being sick’ really mean that you have no joy or peace or compassion in you? I’d like to see this whole preconception differently. We are allo aging and dying inevitably, however this doesn’t need to mean that any of those negative ideas come to your mind such as unhappiness, failure, loss, pain and ending. I wish that I could never lose myself LOVE, JOY, PEACE AND FREEDOM under any harsh condition. 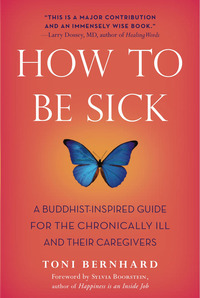 Below is the book about the attitude of seeing the sickness from the one expriencing the long term chronic disorder. hopefully many people benefit from this. When I first got sick, it didn’t take long for me to accumulate a collection of healing CDs from a variety of spiritual traditions. They had one thing in common: I was instructed to breathe in peaceful and healing thoughts and images, and to breathe out my mental and physical suffering. In tonglen practice, however, the instruction is to do just the opposite. We breathe in the suffering of the world and breathe out whatever kindness, serenity, and compassion we have to give. It’s a counter-intuitive practice, which is why the Buddhist nun and teacher Pema Chodron says that tonglen reverses ego’s logic.